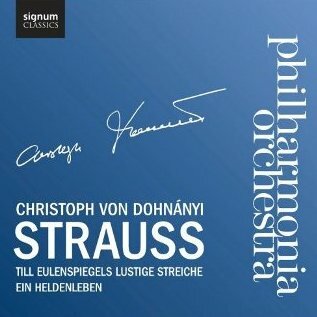 In the heyday of CD recording, Christoph von Dohnányi and his orchestra at the time – The Cleveland Orchestra – recorded this exact same coupling of Strauss tone poems in the studio for Decca, although as far as I can tell, it didn't last long in the catalogue. Some fifteen years later, Dohnányi reminds us once again what a natural Straussian he is, with this release in Signum Classics' series of live recordings with the Philharmonia. The two works were both recorded live at London's Royal Festival Hall, but over six years apart – Till Eulenspiegel in June 2001, before the hall's renovation, and Ein Heldenleben in late 2007 – and Signum's sound is refreshingly natural; it's a bit uncharitable to say it captures the performances 'warts and all', yet there's an honesty about engineering that employs a natural dynamic range and avoids upholstering the sound. As far as the performances are concerned, we have Dohnányi leading relatively fleet-footed accounts of these ever-popular scores. There are some moments of untidiness – the big clarinet run three minutes in to Till rather falls by the wayside, for example – but the playing from the Philharmonia is generally outstanding. Till Eulenspiegel opens the disc and it's an account that's brimming with character and humour. Right from the opening 'once upon a time', with a skittish rendition of the horn solo and a highly characterised clarinet motif, there's a real sense of the orchestra enjoying themselves, revelling in the details of Strauss's narrative. Dohnányi keeps the momentum up so that the whole thing maintains a nervous energy often lacking and he coaxes many beautiful details from his players – particularly observing the markings for string portamenti – as well as encouraging them not to shy away from the less beautiful requirements of the score; I don't think I've ever heard the clarinet whine its glissandi (around 5'50) with quite such abandon as here. Some of the ensemble is less than spot on but the overall effect is invigorating, unstuffy and exciting: exactly as performances of this work should be. Till Eulenspiegel is a work that delights gleefully in its brilliant surface, making few pretentions to metaphysical profundity. Ein Heldenleben, at three times the length, might similarly avoid excessive philosophising, yet requires a sure hand to prevent it degenerating into overblown pomp. This is exactly what we get from Dohnányi so that the ostensible self-aggrandizing surface narrative never obscures the self-deprecatory humour that runs beneath; Strauss did, after all, designate the work as a companion piece to Don Quixote, giving us an idea of how seriously he took its heroism. Under Dohnányi's control the Philharmonia again play outstandingly well – there's no mention of any patching sessions, so one can only assume this is all one take from the concert – and leader Radoslaw Szulc characterizes the 'Hero's Companion' with a rare light touch and tenderness. The conductor's tight rein by no means precludes drama or heroic thrust, as is apparent right from the start and throughout a thrilling battle scene. As with Till, the woodwind are excellent in characterizing their various roles, particularly as the carping critics, while the horns' various outbursts are carried off with the right swaggering assurance. I felt there could have been a little more romantic sweep in the early stages of the love scene but, as it progresses, Dohnányi allows the passion to grow. His way with the final quarter of an hour or so, with the myriad quotations from the 'Works of peace' clearly placed and the final 'consummation' beautifully shaped, is particularly rewarding. This coupling enters a field which, even at low mid price, is awash with many fine performances, and some will no doubt prefer more polished studio efforts to live recordings. However, there's an enormous amount to enjoy here on a disc that's well worth the modest outlay.